Why do so many of the world’s major museums hold bizarre collections of mummified body parts from ancient Egypt–a human head here, for example, and a withered hand there? This is not the kind of question that often pops up in casual conversation, even in the circles I run in. But it came to mind this morning after reading Josie Glausiusz’s excellent review in Nature of a very cool new exhibit at the Brooklyn Museum. The museum’s “Body Parts: Ancient Egyptian Fragments and Amulets,” explores artistic body parts from Ancient Egypt–bits and pieces of worked wood, bronze and obsidian that curator Yekaterina Barbash found tucked away on storage shelves. And Josie Glausiusz, a writer whose work I like a lot, makes several lovely points in the review. She notes, for example, that Egyptian artists were very fond of depicting human perfection. (This is one reason, I suppose, why we see so many young, slender, beautiful people painted on Egyptian tombs.) But some artists were not at all shy about depicting human frailties such as dwarfism or scoliolis, as artifacts in the exhibition demonstrate. But back to my question about the mummified body parts. While researching my book, The Mummy Congress: Science, Obsession and the Everlasting Dead, I toured dozens of museums around the world, and was stunned to learn about all the disembodied heads, hands and the like. The Ashmolean Museum in Oxford, for example, owns the head of a woman, and a hand with a scarab ring. The Field Museum of Natural History in Chicag0 possesses five mummy heads. The Louvre has two heads and a hand. And on it goes. So what’s going on? The answer, I’m afraid, relates to an old antiquities trade. During the nineteenth century, wealthy European tourists clamored to buy Egyptian mummies as souvenirs of their Grand Tours. Indeed, few stately homes were complete at the time without a mummy or two propped up in the corridors. In 1835, however, the Egyptian government passed legislation to control the antiquities trade there: it banned exports of its ancient treasures, including mummies. But enterprising and unscrupulous travelers were not to be denied their souvenirs. 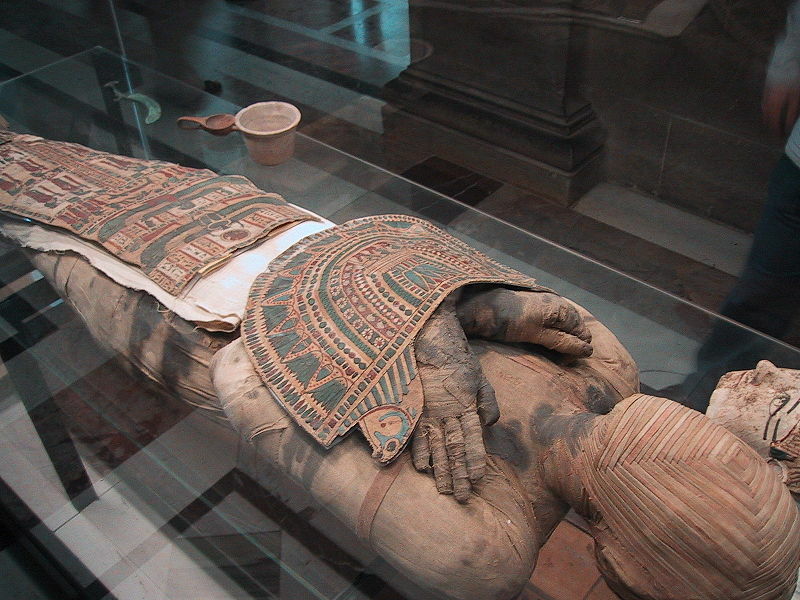 They began to smuggle mummies out–something that proved very tricky. It was impossible, after all, to cram a whole mummy into the steamer trunks of the day, and larger shipping containers attracted too much attention. So antiquities dealers developed a whole new trade. They dismembered Egyptian mummies, hewing and chopping off heads, hands, and feet–the very parts that travellers craved as souvenirs. Back at home, many travelers had these mementos mounted in Victorian glass cases, a fashionable addition at the time to many a mantel. Grotesque, isn’t it? Particularly when the Egyptians deliberately mummified their dead so that their bodies would be preserved whole and intact for eternity. I guess they didn’t count on Victorian souvenir hunters.